This week I am working towards final publication of my first sci-fi novel on CreateSpace – Meniscus: Crossing The Churn. I have incorporated the comments of my editor ( Lee Thompson Editing + https://leethompsonediting.com/ ) into my final draft. I have sent my beta-version to my six beta-readers and will make a few edits based on their comments. A glimpse of the book in final editing. The blue paper was a gift from my husband who thought he was buying white paper! The yellow tabs are just a few last minute changes. The white frame is my way of seeing how the book will look on the final page size! At the last minute I decided my font was too small and switched from Garamond 12 to Garamond 14. It took a while to get all those drawings back to the left hand page! Now, I have printed out a final version to have one last view before I load the cover, text and other information into CreateSpace. 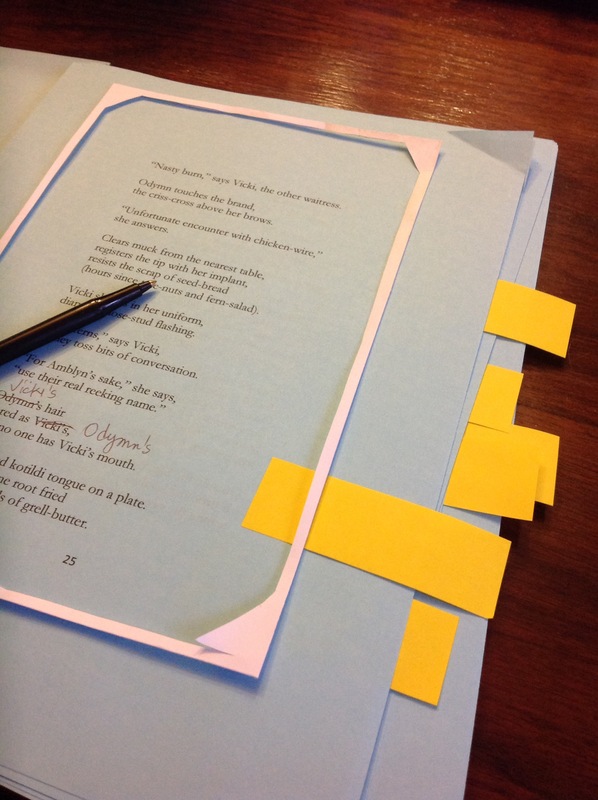 I realize how patient the publisher was with all the edits for my poetry book within easy reach (Chapel Street Editions, 2017). I also realize that my publisher made the final call and ‘pushed the button ‘ regarding the final, final, final draft. Left to my own, I realize I am a bit nervous about this last step and find myself procrastinating, just a little. To that end, I spent all morning, not working on Meniscus:Crossing The Churn, but on the early draft of the fifth book in the series! Congratulations, Jane, on getting to the point of saying done and hitting that button. I recommend a hard copy proof for the final review. I haven’t published my poetry independently – just my children’s books. I have another poetry book down at Steele Rogers. I meant to give them a ring today and forgot! !